Are You Planning to Design Your Kitchen? Learn how to design your dream kitchen. When designing your kitchen, there are several elements to take in consideration including appearance, space, and functionality. 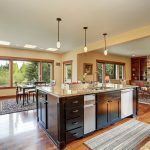 Since the kitchen is usually the one place in the home that receives the most foot traffic, you want to make sure that it is spacious and durable. Designing a kitchen can be a stressful process, but it doesn’t have to be. There are a few simple tips you can follow when designing your home kitchen. One of the most important elements of any kitchen are the countertops because they are highly used. You want to choose countertops that are strong and long lasting, as well as, aesthetically pleasing. Granite and marble are two in-demand countertop materials among homeowners right now. Besides the material, you also want to focus on the size and height of your countertops. Do you want large countertops because you know you will cook constantly? Do you want varying heights of countertops to make it easy for your children to access? When it comes to designing a kitchen, you need to have lighting in mind. You want to let in as much natural lighting in as possible. Exposure to natural light has been shown to increase the mood and energy of people. Besides natural lighting, you want to install task lighting fixtures around your kitchen. You want to have adjustable lighting at your stove and oven, as well, as every workstation. You want your kitchen to be an organized, functional space, so you want to create storage spaces around your kitchen. You want to easily access important items such as pots, pans, and silverware. It is best to take advantage of as much wall space as possible, so look into investing in rack for pots and other items. This entry was posted on Friday, August 3rd, 2018 at 12:14 pm. Both comments and pings are currently closed.